I know, I know, I've had my backtack project pictures hidden (you had to click through), but self-imposed peer pressure has won out (lots of others are just showing theirs). And if you were reading this on something like bloglines, you got the picture anyway without having to clicking through. Back to Comic Life: this was SO easy to put together. It works with iPhoto, so all your pictures automatically show up. You choose your layout and then drag-drop pictures in. Wow! I love it! Other 2005 Apple Design award winners are here at MacWorld. Other ones that I like are Delicious Library and eDrawings. 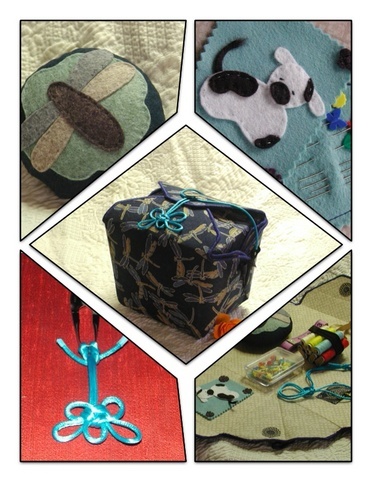 Yay, last night I finished sewing the last component of my back-tack project. I now just need to get a few more goodies to tuck inside the package and then send it off. Once again, no pictures up front. Click on "Continue reading" if you want to see the finished project. 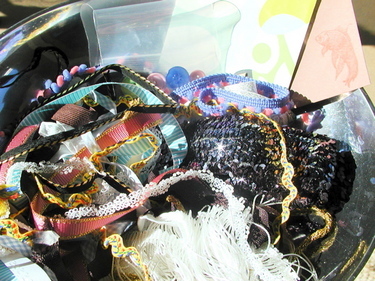 See my previous post ("Another trinket") if you want a hint about whether you might be my backtack pal. 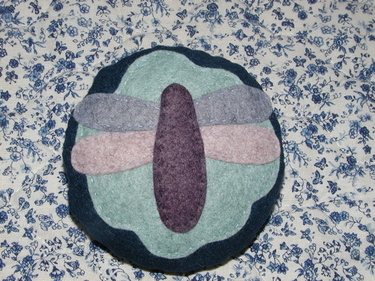 Here's a dragonfly pincushion, made of wool felt. It seemed appropriate for the month of softies, and also fit in with the dragonfly theme of my back-tack project. So it'll be on its way to my back-tack pal soon. It's nice and squishy, and just the right size for a pincushion, so I'll be making another for myself soon. I'm getting really close to finishing my back-tack project. I'm also becoming attached to it, I may have to make another one for myself. Here's my latest piece, it's a cover for a needle-storage pad. Where's the picture? Well, it might give away the secret of who my back-tack pal is. So, if you're wanting to be surprised, then don't click on "Continue reading". If you don't care about surprises or aren't participating in back-tack, then click on. 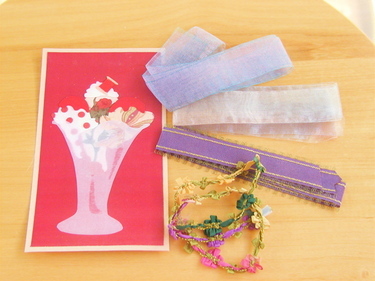 Here's another hint: I've never posted a comment on my back-tack pal's blog. (Not because I haven't been reading, I have been. Just not commenting. I figured I'd give myself away somehow.) So if you know that I've posted a comment on your blog, you're not my back-tack pal. My parents had a fairly large garden in the backyard, and one year there was a bumper crop of tomatoes. 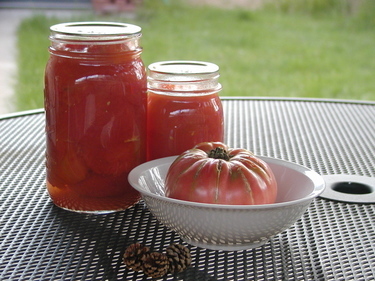 We ate so many tomatoes that summer, and canned so many more. I remember being so sick of tomatoes. At the end of the season, we still had so many left, both green and red, that my brother and I had fights with them, flinging them at each other as we ducked among the drying stalks. Normally my mom would never have allowed this, but I guess perhaps she was sick of tomatoes too because she let us do it. I was outside yesterday with the camera, so I grabbed a few shots of our ridiculously abundant flowers (ridiculous only for the desert, people from wetter areas probably would think our yard was a little bare). Last year we had irrigation installed, so we're not using very much water but it gets applied regularly. Which seems to be less wasteful than my previous method, which was to water dry dirt patches whenever I remembered (every few weeks) in the hopes that whatever had been living there would come back. The first two are columbines, they do pretty well in the dry conditions here, and if you give them just a little bit of water they do great. They prefer partial or full shade. The third one I call a hummer plant because the hummingbirds like it, but I think it's really called a red hot poker. They're all over the place here, so another good arid plant. These seem to like a little more sun than the columbines. 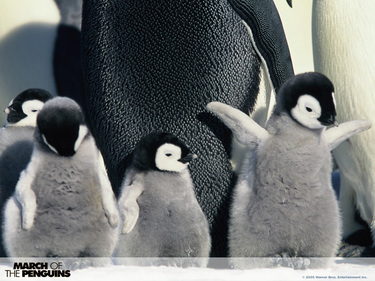 I can't wait to see this movie, March of the Penguins. Quicktime trailer is here. It looks so cute! And it's rated G. Since it's not coming here til August, perhaps if someone sees it earlier (release date is next week, 24 June), you can tell me if there are any "nature" scenes that are too, um, realistic for young kids. You know, like Wild, Wild, World of Animals stuff, the lion taking down the zebra. Or in this case, if there are any seals taking out any baby penguins. I had a case of insomnia last night. 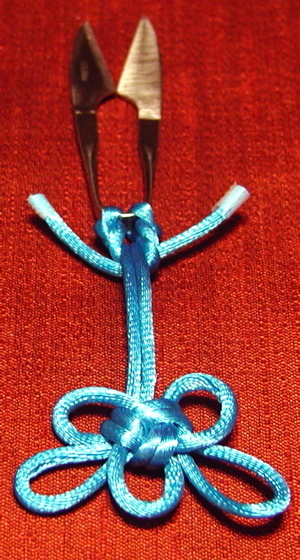 Just before going to bed I did this cute decorative knot in blue shiny cording, to attach to a tiny pair of snippers that I'll be putting into my back-tack sewing kit. I started trying to think of a cool knot to use to attach it to the snippers, but bedtime came around so I stopped. I slept for about 3 hours, then woke up and couldn't stop going over knots in my head. Since I'm not an expert knot-tier, this exercise was very frustrating and quite useless. So I finally got up, grabbed the cord, snipper, and the knots book, and played. It was fun, but after an hour I decided I had already spent way too much time on it. Besides, I was starting to get sleepy. So I did a modified cat's paw to attach it to the snippers, took a picture, and went to bed. How do you catch-up on blogs? This weekend, after reading about it on WWDN, I signed up for and tried bloglines. It's a way to stay up-to-date with blogs et al., all in one place (and it's free). It took me a little while to put in all my regularly-visited blogs, but once they were in I just needed to click on the My Feeds tab and then it automatically checks for new entries. I don't know how many blogs other people check regularly, but I was up to about 50, and it took a long time to go to each one to see what was new. This way, they're delivered all to me! So far (after 2 days) I'm pretty happy with this one, but still I wonder what other people use to check up on all their blogs. Care to tell me? I finally got started this weekend on my backtack project. I'm still a little uncertain about how it will turn out, but I'm giving this one idea a go. I'll post pictures once I'm a little further along. I had a frustrating thing happen last week. I volunteered to do some astronomy activities for a summer camp in a town in the nearby Navajo reservation. I also volunteered to teach knitting at the same summer camp. My date is coming up tomorrow, and I've been collecting yarn and such using the 40% off coupons from Michaels. Last week I called to find out how many kids had signed up so that I could be sure to have enough yarn and needles, and they told me "We didn't put that one in." My response? "Oh. Sure. OK." I don't know which was worse. Why didn't they put in my knitting course? And why couldn't they have told me about this a month ago, since they knew then? And why can't I actually say this to someone on the phone rather than just saying "sure, whatever you want is fine by me?" I returned everything to Michaels this weekend, I didn't want to have it around the house reminding me. And I go tomorrow to do my astronomy activity. Sorry for the horrible glare in this picture. I had some others that weren't in full sunshine, but those seem to have become corrupted in the camera.